The Canadian Bred Horse of the Year Award is given to a horse bred within Canada who holds an outstanding national or international performance record that has helped to enhance the reputation and visibility of Canadian bred horses. The winner for 2017 is Foxwood High, a 15-year-old Canadian Sport Horse gelding owned by John and Judy Rumble of Schomberg, ON. John is a Canadian Olympian in Eventing who helped Canada bring home the bronze medal from the 1956 Stockholm Olympics. And, the passion for eventing has never faltered in the Rumble household. In the early 2000s he and Judy decided to put their dream of owning an eventing horse with Olympic potential into action. The big bay gelding known as “Woody” first caught John and Judy’s eye in 2007 as a leggy 17.2hh five-year-old. Woody was bred by Canadian Olympian show jumping athlete, Hugh Graham’s KingRidge Stables in King, ON. He is out of the Thoroughbred mare, Evita II, and sired by Rio Bronco W – an elite breeding stallion from fellow Canadian breeders and 2015 EC Canadian Breeder of the Year, W. Charlot Farms in Stratford, ON. By 2011, John added Canadian Olympian Selena O’Hanlon to the team as Woody’s rider. As of 2018, they are closing in on a decade of representing Canada at the FEI level in eventing. Woody proved well suited for eventing, and with Selena in the irons, had an incredible Canadian Equestrian Team debut at the 2011 Pan American Games in Guadalajara, MEX, helping the Canadian Eventing Team bring home the silver medal. In 2014, Woody and Selena once again competed for Canada, this time at the FEI World Equestrian Games in Normandy, FRA, where they contributed to Canada’s sixth place finish – thereby securing the Canadian Eventing Team’s berth to the 2016 Rio Olympic Games. Over the next few years, Woody and Selena racked up top 10 placings at the 3* level across North America, but 2017 proved to be their best season yet. Their accolades included an impressive 11th place finish at the iconic CCI 4* Rolex Kentucky Three-Day Event (RK3DE), held in April in Lexington, KY, followed by a Team Silver Medal from the CICO 3* FEI Nations’ Cup™ Eventing, held at the Great Meadow International in The Plains, VA in July. Woody was one of just three horses out of 32 starters to lay down a double-clear cross-country performance in the nations’ cup. The end of the season proved even more successful for Woody and Selena. In September they travelled to Unionville, PA for the Plantation Field International Horse Trials and faced off against top international competitors to finish third overall, and a mere 2.5 penalties behind the winner. However, their crowning achievement of the season was the CCI 3* Fair Hill International, held in October in Elkton, MD. After achieving personal best scores in all three phases, Woody and Selena made history as the first-ever Canadians to win the CCI 3* division. 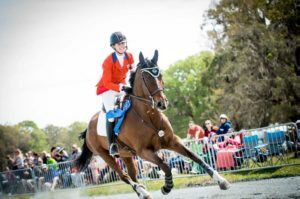 This historic win was the cherry on top of a highly successful and consistent season and led to Woody being named the United States Eventing Association (USEA) Advanced Horse of the Year. He was also the runner-up for the overall USEA Horse of the Year title, coming in just three points behind the winner. Woody is an incredible ambassador for Canadian bred horses, and a testament to the world-class breeding programs within Canada – and the top results they produce on the world stage. Therefore, EC is thrilled to name Foxwood High the 2017 Canadian Bred Horse of the Year and congratulates the entire team behind him, including breeder, Hugh Graham, owners, John and Judy Rumble, and rider, Selena O’Hanlon.